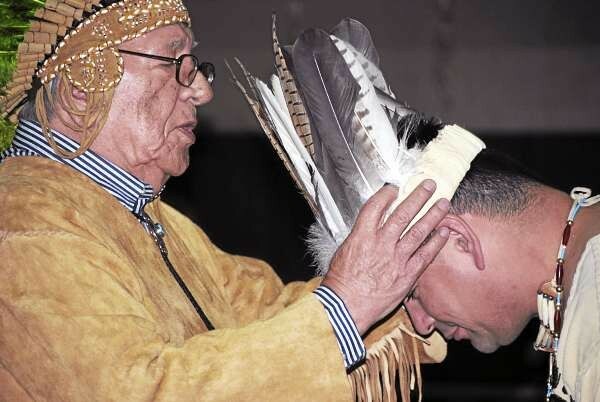 INDIAN TOWNSHIP, Maine — The election of a new tribal governor may have taken place weeks ago, but Friday night the Passamaquoddy Tribe crowned him chief as a grandfather passed the ceremonial headdress to his grandson Gov. Joseph Socobasin. Former Gov. John Stevens embraced his grandson as the centuries-old traditional inauguration was held. The two-hour ceremony at Motahkmiqewi Skulhawossol — Indian Township School — was full of emotion as well as the traditional chants, dancing and drumming. “This is a great responsibility and one I willingly accept,” Socobasin said. 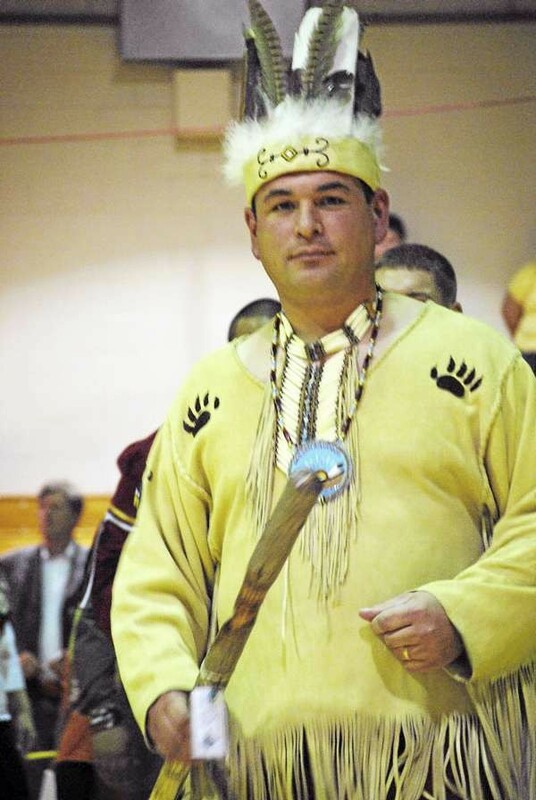 He promised to improve tribal services and to work to bring the tribe at Pleasant Point and Indian Township closer together. “In past years, we have become separated from our sister community of Pleasant Point,” he said. “It is difficult and I don’t accept that. We must come together, not just as Passamaquoddys, but as Penobscots, Maliseets and Micmacs. Socobasin lost both of his parents when he was 8 years old and was raised by his grandmother Blanche Sockabasin. “She took me, my sister and my two brothers in, even while she still had five or six of her own children living there,” he said. Several speakers, including Penobscot Tribal Gov. Kirk Francis, talked about high unemployment and social problems within both tribes. “Many of the social issues in this community are because people have a lack of hope,” Socobasin said. Unemployment within the Passamaquoddy Tribe is greater than 50 percent. “We have 50 to 100 people applying for every position. We need to change that,” Socobasin said. Socobasin praised former Gov. William Nicholas, who did not attend the event, for bringing the tribe back to sound financial footing over the past four years. “I commend him for the good work he did,” Socobasin said. During the ceremony, new council members and the tribe’s representatives to the Legislature also were inaugurated. They were Lt. Gov. Clayton Sockabasin; council members Nipawset Sabattus, Gerald Stevens, Leslie Nicholas, Matthew Dana III, Elizabeth Neptune and Richard Sabattus; and the tribal representative to the Legislature, Madonna Soctomah. Soctomah said because of the change in political parties in the Legislature, the coming years will be difficult. “Help us,” she asked tribal members. The ceremony, which included traditions such as smudging, shawl dancing, drumming and chanting, was followed by a community meal of traditional foods. The ceremony was led by Roger Paul, who explained that in ages past, elections included five days of festivities, and celebrations could last for up to two weeks. If there was a disputed council seat, it often was settled by a test of strength. He said the Passamaquoddy Tribe was rich in traditions and that the inauguration ceremony was among the least changed in its culture.